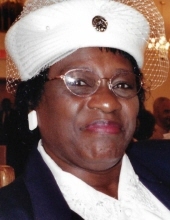 On Tuesday, December 18, 2018, Rosa Lemon Pearson, widow of the late George Franklin Pearson, heard her master's call at McLeod Health Hospital, Florence. Born on December 7, 1939, in Manning, she was a daughter of the late Milton & Mary Thames Lemon. The service celebrating her life will take place on Sunday, December 23, 2018, @ 3:00pm from the Mt. Zero Missionary Baptist Church, 7827 Paxville Hwy., Manning, where the Rev. Dr. Elizabeth Richburg, Associate Minister, will preside. The Pastor, The Rev. Jeffery Jackson, will bring words of consolation. The service of committal will follow in the family plot located in the Mt. Zero Missionary Baptist Church Cemetery. Public viewing will take place on Saturday, December 22, 2018, from 4:00pm-7:00pm at the Fleming & DeLaine Chapel, 222 West Boyce St. The family is receiving relatives and friends at the residence, 1205 Hyman Drive, Ram Bay Community of Manning. To send flowers or a remembrance gift to the family of Rosa Lemon Pearson, please visit our Tribute Store. "Email Address" would like to share the life celebration of Rosa Lemon Pearson. Click on the "link" to go to share a favorite memory or leave a condolence message for the family.